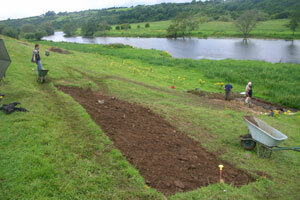 This interim report describes the work undertaken during the 2010 excavation season at Rossnaree Co. Meath. The excavation took place over a four-week period between Monday 5th July and Friday 30th July and targeted a series of topographical and geophysical anomalies identified in previous survey work. The site was first discovered as a dense scatter of lithic (chipped stone) artefacts systematically recovered from the surface of a tilled field during a major extensive surface collection undertaken some years previously in the Brú na Bóinne area (National Museum of Ireland collection number C97.2). Subsequent multi-method geophysical survey funded by the Heritage Council and undertaken by Kevin Barton of Landscape and Geophysical Services revealed the presence of a large multi-vallate enclosure on the banks of the River Boyne which is roughly D-shaped and is bounded on the north and east sited by the River Boyne at the point where the famous ‘Bend of the Boyne’ begins. The enclosure cordons off an area of approximately 3.5 hectares and measures c.250m east-west by c. 150m north-south. This enclosure was reported to the Archaeological Survey of Ireland and an RMP number was subsequently issued (ME019-080—). Excavation funding was granted for a dig in 2010 by the Royal Irish Academy Committee for Archaeology and four trenches in total were opened and excavated during the season. Two of these trenches focused on extant low bank-and-ditch features located to the north of the tillage field close to the riverbank. 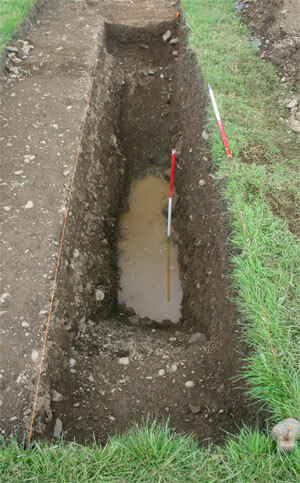 A third trench (Trench 4) examined the continuation of the line of the outer enclosure in the low floodplain to the east of the core area of the site and a fourth trench (Trench 5) investigated the area around a semi-buried greywacke slab close to the field boundary in the pasture field to the east of the core area of the site. While flint flakes and tools were frequently recovered, the major features on the site, especially the bank feature in Trench 3, was dated to the early medieval period on the basis of the recovery of a double-sided bone or antler comb fragment. A fragment of a copper-alloy strap was also recovered from the same context. A fragment of a lignite bracelet was also recovered from topsoil in Trrench 5, also indicative of activity during the early medieval period. 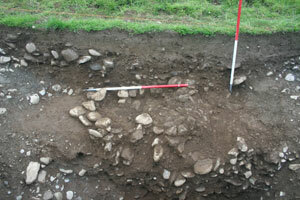 Trench 3 fully filled...at last! Once again, I am reduced to beginning a post by talking about the weather. Today was the last day of the dig and a lot of hard work lay in store for the small but elite group of diggers remaining on site. 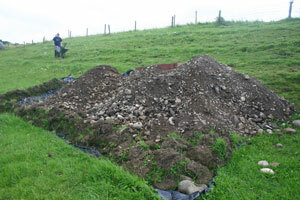 If desodding is regarded as an unpleasant job, backfilling is much more difficult and demoralising. To make matters worse, the weather was not kind to us today, making the job much more arduous. It started off drizzly, stopped for a while, started again, and so on until about three o’clock. 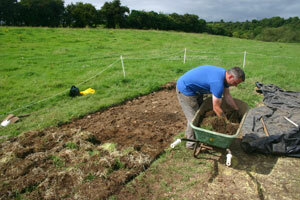 Although we had completely backfilled Trench 4 already, there were still two, Trenches 1 and 3, to backfill. These were going to be tougher than 4 because they were situated on a slope. Because of the topography immediately around these trenches, there was no option at the beginning of the excavation but to place the spoilheaps for each of them downslope of the trenches. This meant that every bucketful of spoil dug out of each of these trenches had to be shovelled into wheelbarrows and barrowed back uphill. At Trench 3, this meant that a zig-zag route was required, lengthening each journey across the slippery slope surface. 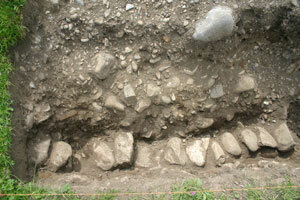 In spite of the challenging conditions, we eventually reached our goal and completely filled the trench. Then we moved on to Trench 4. 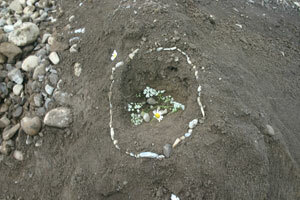 A ‘closing deposit’ had been created on the top of the spoilheap by Clíodhna (age 6! ), perhaps to appease the spirits of the place and atone for the disturbance that they had to endure over the previous four weeks. We worked until six, when we were fit to drop and a big thank you goes to all of the team who pitched in on this dreaded day lightening the workload with cheery conversation (and even some song!). A big thank you goes to all who assisted with the excavation. Many people worked on the site over the few weeks, some longer than others. All time spent on the site helped and is greatly apprecated. So to Matt, Kieran, Darren, Eimear, Niamh, Deirdre, Eamonn, Andrew, Valerie, Mark, Ailbhe, Michael, Gary, Jessica, Carol, Kim and Louise a very big thank-you. Thanks to Kevin and Mark for the surveying and the support and encouragement. To Paschal, thanks for facilitating our access to the field, to Fin and Steve for lending us the equipment we needed and helping with the logistics, to Niamh for the scones, to our visitors who took the time to come and see what was going on and also give their support, both moral and practical. And finally, to Aisling, many many thanks for allowing us access to one of the most enchanted corners of this island for the month. Because the sitework is now finished, there will be no more day-by-day posts. However, we hope to do some additional ‘tidying up’ survey work soon in order to try to identify the presence of potential prehistoric features and I will post the progress and results of that work. Also, the post-excavation work will now commence, but as much of this will require additional funding which will hopefully be provided at a later stage, and there will be occasional posts on this as the work is done. Thanks to everyone who took the time to check out the blog; many of the comments came from people who are not known to me and who seem not to be archaeologists but who, nonetheless, found the blog interesting and informative. Today, a very dramatic occurrence took place – Trench 4 disappeared. 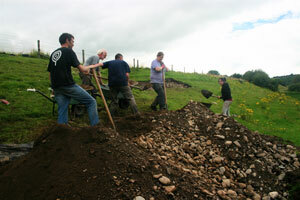 Seriously, we had completed all the necessary work in that trench and yesterday, Kieran had started to backfill. Today, this job was completed in fine style by Kieran, Eimear, Niamh and Darren. We were even able to replace the sods back on the top. In a few weeks, it will be like we weren’t there at all. It is a bit sore having to fill in after so much slow painstaking work, but that is the name of the game in research archaeology. 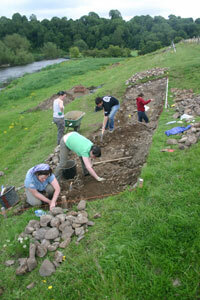 Some very serious work was done in Trench 1 today by a very dedicated group of individuals. 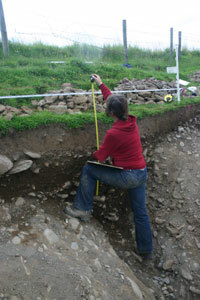 The first job was done by Louise who had yesterday discovered the pit-like feature at the south side of the trench. She drew a quick section of the feature and a plan as well. Once this was done, it was possible to start excavating again and although it had been decided not to excavate the full extent of the trench in order to save time, they went ahead and took out the remaining layers anyway. A fantastic piece of work. At this stage the final jobs to be done here are to draw the sections and take the samples. By the afternoon, Kim and Louise were setting up to start this so by tomorrow lunch time we should be ready to take samples. Things are moving very quickly! Meanwhile in Trench 1 Matt and Darren started off the morning cleaning up the lower portions of the feature they had uncovered yesterday. They were preparing for record photographs and also for planning and drawing the section. The feature itself is interesting because it seems to be at a lower level than the wall and thus is earlier in date. It seems to have functioned as a revetting feature which held the slope in place. The slope is composed of quite loose gravels and this may have caused problems for the inhabitants of the site who wanted a more stable slope. As I mentioned yesterday, there seem to be similar features peeping out from the grass in the slope further along from the trenches where we are digging. This cleaning was completed by mid-morning, after which Darren went to Trench 4 and Matt got going setting up for drawing the plan. While they were cleaning down onto this final level, a number of very interesting finds came up which throw a lot of light on the date of the activity in this area. Almost directly where the wall feature made of large cobbles had stood within the bank, they found a portion of a double-sided comb, possibly made of antler. This is little bigger than my thumbnail but is nonetheless very significant. Finds like these typically date to the eighth century AD or later (as far as I know – I’ll have to check this) and it tells us that the bank/wall (and probably the ditch beside it as well) must date to this time or a little bit later. This is clear dating evidence for the feature from excavation and means we don’t have to wait months for radiocarbon dating in order to find out what date this activity was. A couple of other finds from this general period came up within hours – a small copper-alloy strap and a fragment of an iron vessel. Sometimes this is the way things work out in archaeology – you don’t get the crucial finds until almost the last minute. in spite of so much flint from these layers, it is now clear that the feature is Early Medieval. 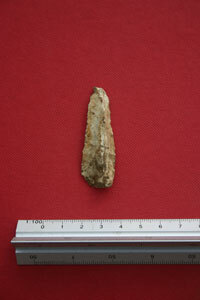 The flint was probably on site already and was incorporated into refuse material used by the Early Medieval occupants of the site and there is still no doubt that the site was intensively used in Neolithic times. We now also know that it was also used intensively in Early Medieval times as well. 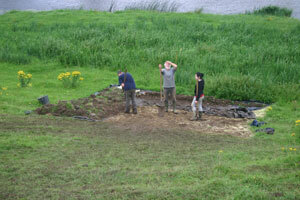 We have another multi-period site, a bit like how the site at Knowth across the river was used. The big questions now are are the other banks and ditches the same date and where are the structures that were used in prehistoric times. There has been a bit of coverage of a recent discovery of a low-visibility monument very close to Stonehenge. This was discovered during an intense geophysical survey of the area by English Heritage and is part of a survey that is planned to last three years. The site is interesting and, as they said themselves, it bodes very well for the rest of their work to have found a site so quickly. 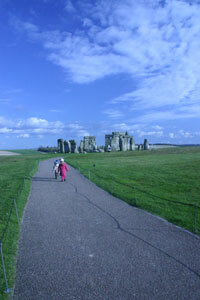 You can view some of the BBC’s reports at this link: Stonehenge. Reports of this discovery were carried on most of the UK national TV news programmes, and although this is the silly season, I can’t help wondering whether there is a difference in the attitudes to new archaeological discoveries in Britain and Ireland. Geophysical survey work like this has been going on over the past three years here in the Brú na Bóinne WHS, albeit on a smaller scale, which has received scant attention. By contrast, there has been a considerable amount of media interest in the excavation at Rossnaree, at least at a local level. It seems that in the public (or media) consciousness here, the work of archaeologists is perceived as digging holes in the ground and finding stuff. 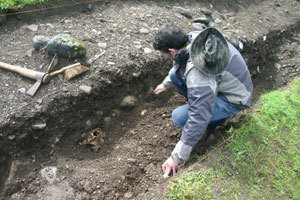 As followers of this blog (and others) will know, there is a lot more work involved in archaeology than just excavation. We have sites just as good as what was discovered at Stonehenge the other day. Just by way of comparison, the new Stonehenge site is about 25m in diameter. The Rossnaree site is about ten times larger, measuring about 250m east-west and 200m north south. The archaeology of Brú na Bóinne and many other parts of our country are in no way lower quality or less interesting than that of Stonehenge or elsewhere and we (archaeologists and media) should be doing more to celebrate this rich and diverse aspect of our heritage. There is definitely scope for a Stonehenge-type geophysical survey project, similarly structured and resourced, in the Brú na Bóinne WHS. This is work that really needs to be done for us to more fully understand how this very important landscape was used by past generations and also to more properly take stock of the archaeological resource of the area to inform its effective presentation and management. 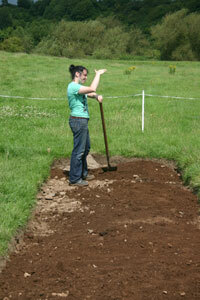 Anyway, back to the business of the Rossnaree excavation. We are really trying to schedule the remaining jobs to be done around the site at the moment as we look forward to our last week on site. 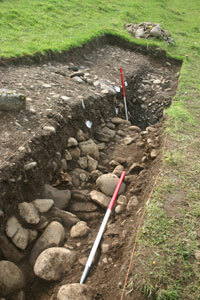 The same work of the last few days continued in each trench. In Trench 1 Kieran, Eimear, Darren and Deirdre continued to take down and sample the levels in the ditch fill, sieving as they went. The extra manpower in this trench payed big dividends and a lot of progress was made. Just two more fills to be removed before the bottom is reached. Next week, to finish off the trench and shut it down, we will move into the western end to see how deep the stony surface is above natural. We suspect (and hope) that it is not too deep because we really don’t have time to get bogged down. The ERT section suggests that there’s not too much depth in this area but we’ll just have to wait and see what turns up. 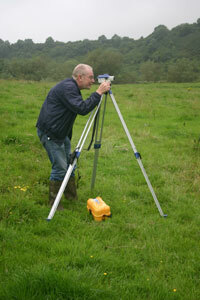 We had a visit from Kevin the geophysicist again today who had a few jobs to do around the site. He is dropping back on a regular basis to see how the excavation progresses and also to see how well the excavation evidence matches up with the results of his earlier geophysical surveys. In Trenches 1 & 3 he is particularly ineterested in the match because the ERT line runs straight through the trenches we dug and should match up exactly. It is relatively rare that geophysical surveyors get to match up the results of their surveys with ‘reality’, i.e., the excavated layers themselves. These are the opportunities afforded by research excavation – the chance to experiment a bit and learn new ways of doing things. 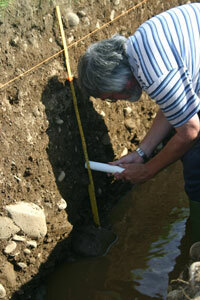 Kevin also decided to take another series of soil samples from Trench 4 of very closely spaced intervals. Again, this is part of a research approach and may help to determine whether this technique is worth using in similar situations on other sites. I hope all the hard work pays off! Fridays tend to be a day when we have a nicer than normal tea break. Some of the family came by to join in and we had a nice gathering in the cabin before getting back to work down by the river. We were spoilt for choice with home-made scones, which always go down well, and Deirdre also brought some extra goodies as well. They always did say that an army marches on its stomach and it is very important to keep morale up. We’ll certainly need it next week. The day started out well in line with the Met Éireann predictions. However, the forecast was for deteriorating conditions with frequent heavy showers in the afternoon. It was looking like we were going to lose some time. 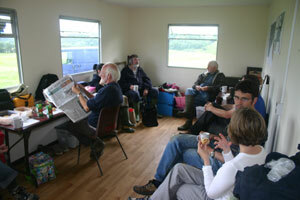 However, it only rained once at lunch time but it was a very heavy and prolonged shower. Once it finished, despite being surrounded by slaty grey thundery clouds, it stayed dry. In Trench 4 Kieran got stuck into recording the section. The process is to set up a baseline making sure that it is level. In the photo this is just below the edge of the trench and there is also a long measuring tape attached to it to help with the drawing. 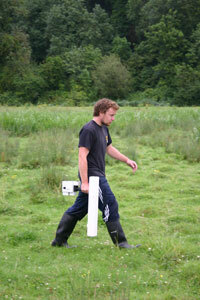 This is used to measure down to points to be recorded, e.g. the tops of layers, stones, the edges of a ditch. Each point is meticulously measured and plotted on a scale drawing so that there is a permanent accurate record of the material that has been dug through on an archaeological excavation. It is like a giant version of join-the-dots. 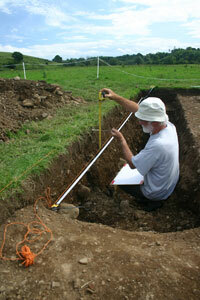 Kieran was recording the various fills of the outer enclosure ditched as revealed in the side of Trench 4. Even with all of the modern technology that is available now, there is still nothing to beat the trained and experienced eye of an archaeologist, especially the person who has dug the particular trench. Some of the differences between layers are so slight and subtle that they are beyond the ability of machines to detect and must be drawn by hand. Even with all of the advances in digital photography it is still best to do this job the tried and tested way, even if it does seem slow. 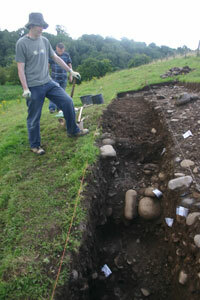 In Trench 1 Niamh and Gary continued to take down ditch fill material, sampling as they go. A layer of stones has appeared and the base of one of the layers that hasn’t shown previously do the plan is to expose the stones to see if they form any pattern or whether they join with any of the other stony layers exposed in the section. Although they are likely to be material that has gradually slipped down the slope from higher up coming to rest in the upper fills of the enclosure ditch, tomorrow should reveal full their extent and allow us to decide properly why the stones are likely to be there. In the photo it is possible to see the clear difference in colour between the face of the bank and the ditch cut, both of which are stony and more grey in colour, and the fill material which is much more brown. 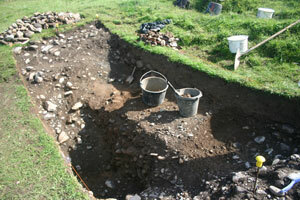 Very good progress was made in Trench 1 today because of the extra personnel there. 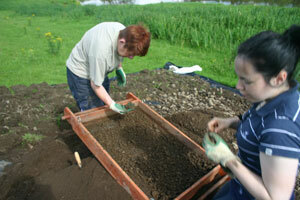 Deirdre and Eimear took over sieving duties for Matt and Darren so that the digging cound take place continuously. 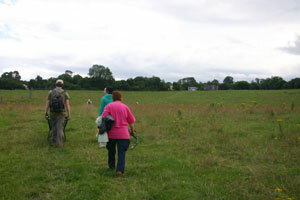 Good finds were still being found through sieveing including the usual animal bone and flint. The animal bone assemblage is increasing in size and although we are only recovering fragments in most cases, we hope that analysis of the bone will be able to tell us about the economy of the site, i.e., what they were raising and eating. The picture of what is happening in Trench 1 is changing rapidly as a result. 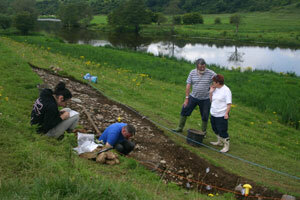 It now seems that the point where the ditch met the bank was defined by large cobbles which were mentioned already. These cobbles seem to have served as a revetment or low wall keeping the core of the bank in place and they also seem to mark the edge of a layer of cobbles within the wall. These will be further revealed over the next day or two and hopefully it will become clearer to us as to what they were for. Towards the end of the day, however, another interesting find was made. A theme has been developing over the last few weeks that we’ve been finding cattle bones in significant places in the excavation today’s find was yet another example of this trend. Set on top of (or possibly within) the cobbles on the bank in Trench 1, what appears to be a cow’s skull began to be revealed. This may just be rubbish thrown out from higher up in the site but at the moment it appears to have been perhaps deliberately placed within the material in the bank of the inner enclosure. Is there a real theme developing in this site? Are cattle somehow important to what the site was used for? Hopefully we’ll have some answers before long. 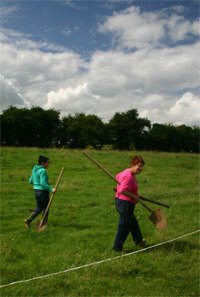 So much of what we do in Ireland revolves around the weather, especially for those who work outdoors. You tend to notice every little gust of wind and cloud that crosses the sky to a much greater extent than those who have to work inside each day. Day 12 was a good day weatherwise and there were no interruptions from above. We even had to break out the sunblock. A few more days like this between now and the end and we should be alright! 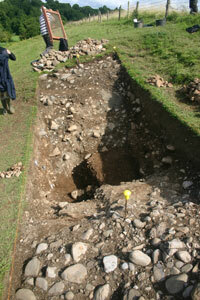 In Trench 1 Gary and Niamh continued to take out the upper ditch fills across the outer enclosure ditch. They succeeded in completely removing one of the layers, taking a bulk sample of the soil for future specialist analysis, and began to remove the next one, also sampling it and removing it. Good work was done and the level of the trench is steadily coming down. 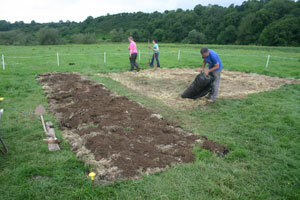 More and more ‘natural’ or undisturbed, non-archaeological soil is becoming visible. In Trench 3 Matt and Darren continued working on the ditch fills there especially the area overlying the bank at the eastern side of the trench. The geophysical survey carried out prior to the excavation suggested that this inner area to the east of the bank was lower resistance, perhaps more moist and organic. 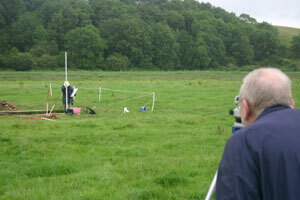 The more digging that Matt and Darren do in this area, the more the initial geophysics is proven right. The soils in this area do indeed appear to be different to the others over the ditch and may represent an area where rubbish was disposed of creating a midden or ‘compost heap’ layer of decayed organic material. Because this was so long ago, this material doesn’t look like compost but the soil is slightly darker and richer than those around it and definitely suggests that there is organic material in it. When we sample this soil and the specialists take a look, we will know for certain. Matt also did some work on the section face – the vertical side of the trench – to work out the exact sequence of layers and fills and their relationships to each other. 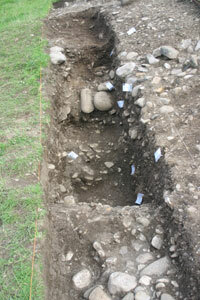 They also uncovered a bit more of the layer of large cobbles in the edge of the ditch. This may have been a deliberate design feature where the inner face of the ditch (outer face of the bank) was cladded in large stones. They may also represent a foundation layer upon which the bank was constructed. 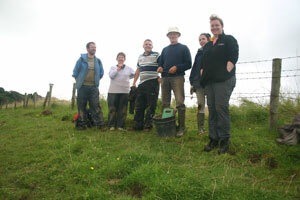 Work in this area has begun to speed up because Matt and Darren were joined by Eimear and Deirdre from Trench 4. As Kieran is drawing there, there is nothing for them to do so they were redeployed as the Trench 3 support team.